SMS, though a hoax, must serve as a wake-up call to S'poreans. By Deborah Choo. I received a text message around 2.20 pm on Saturday. 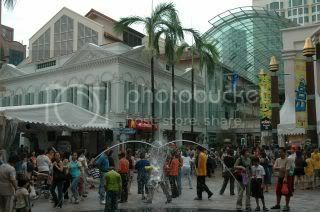 It referred to a possible terrorist attack around Bugis Junction. I headed to Bugis to check it out. There were many policemen, as mentioned in the SMS. Six, to be exact, which was four more than the usual two that would be seen doing their usual patrols on normal days. Two pairs were stationed at both the extreme corners of the MRT basement platform, and one pair was seen patrolling up and down both levels of the station. Basement One of Bugis Junction was flooded with people. For security purposes, the police would most likely send their men out in civilian clothes. There were, if I had spotted correctly, several policemen at work. However, I realized that only two were combing basement 1 and level 1, while another was stationed at a fairly less crowded area reading an outdated copy of a local newspaper – which made him fairly obvious to even an untrained eye. According to my study of the area I combed, should a real terrorist attack have occurred, the most likely places to be targeted would have been either inside the MRT train itself, at basement 1 of Bugis Junction, or Bugis street, for these places are the most crowded at most times. However, the security at those places was not as fiercely guarded as it should have been. If there had been a terrorist attack in the MRT train, the chances of nabbing the terrorists involved before the bomb went off was slim. Besides the announcement saying, “Please do not leave your bags unattended. If you see any suspicious person or article, please inform our staff, or press the emergency button,” being played slightly more frequently than usual in the train and station, there were no policemen stationed in the MRT train itself to deter any would-be bomber. There could have been two policemen assigned to patrol the MRT trains, and a bomb expert present. In the event of a real attack, it may have been impossible to stop the MRT train midway to let the passengers alight quickly if the train was in between two destinations. Hence, having a bomb expert would have greatly increased the passengers’ chances of escape till they reach the next stop. Also, there should have been more policemen patrolling basement 1 and level 1 of Bugis Junction. However, I have to clarify that there is a possibility that there might have been more policemen – in civilian clothes – that I may have missed. In addition, there are dustbins stationed at almost every stretch of road around the outer area of the shopping mall, beside the traffic lights, at every escalator, and at Bugis Village’s bus stop which is often crowded. And at the entrances of every train station, there is the ubiquitous trash bin. Notice them the next time you are at the station and imagine what will happen if a bomb was deposited in them. And as we open our doors to even more foreigners and increase the population, thus leading to even more crowded areas around our tiny city, we must not forget the simple precautionary measures we can – and should – take. Central London experienced a terror attack in 2005 where four bombs were detonated within minutes of each other. The Russell Square bomb, which was the third one to go off in that July 2005 attack, happened while the train was travelling between King’s Cross and Russell Square stations. In the aftermath of that attack, the authorities, as a precautionary measure, reduced the number of trash bins around the area. This is to prevent terrorist from depositing their bombs in them. In Singapore, the trash bins are everywhere – even at the entrances to the train stations, the very place which we want to prevent any bomb attacks. Singapore could consider reducing the number of dustbins around town centres and crowded areas to reduce the risk of a bomb being planted – an area I realised many people tend to overlook. After the incident today, though the SMS turned out to be a hoax, precautionary measures could have been more comprehensive, and there remain areas that need to be looked into to continually narrow the possible loopholes and danger spots so as to make Singapore a safer place to live in. In the midst of scouting around Bugis on 21st February, Saturday, I discovered a new set of problem that Singapore is facing – Singaporeans’ lack of vigilance. “It’s most probably a hoax. Why are you so worried?” was one of the many similar responses I got when I asked about the SMS. Most of these replies stem from the trust that they have in the Singapore government and police force to deal with the situation swiftly. However, many failed to realise that their “I-don’t-really-care” attitude could lead to dire consequences. Singaporeans have to break out of their comfort zone and realise how close terrorism is to us. As alert and protective as the authorities may be, Singaporeans must realise that only when each individual realises the importance of this issue, and is vigilant, can citizens work together with the government and the police to counter any threats from terrorists. It seems, though, that our people still have not learnt their lessons from previous events. On 20th December 2008, about 200 passengers were evacuated at Toa Payoh MRT Station due to a non-toxic gas leak from the train’s air-conditioning system. However, Singaporeans waited for further instructions and continued to be nonchalant about the situation. There were no attempts to run or to leave that place. News remained news to most Singaporeans. The SMS about bombs being planted in Bugis were only rumours to them. “Aiya, the SMS is a hoax lah! Singapore so safe! What can happen?”, said a source who wished to remain anonymous. Nonetheless, it reflected the attitudes of many Singaporeans who remain nonchalant about such threats. In addition, Singaporeans may not know how to react in a crisis. It is time that we are put through a simulated drill. It does not have to be nationwide, but at least a drill conducted for every block of flats. It will take time to plan such a wide-scale exercise, and a big cut off our national defence budget. However, this issue has to be addressed seriously – and swiftly – as the threat of terrorism looms closer to home. While we enjoy the safety of our offices and homes reading news of attacks such as the one of the 7 July bombing in London, or the Mumbai bombing in Pakistan in November last year, terrorists continue to plot and scheme ways and means to inflict maximum damage to people and property. Singapore has invested much in defense technology and are masters at strategizing, analyzing and weighing pros and cons. This, however, is not a problem that we can solve just by placing every human into a “Make Him Vigilant!” machine to induce that sense of urgency and threat – it has to be inculcated in them. Though this SMS was a hoax, it must serve as a wake-up call for many who still think that terrorism does not concern us. It is not just Bugis we are talking about today. The youth who circulated the sms about a possible bomb attack in Bugis has been detained by the police. See here.